Mitchell County is now in its third week of cleaning up after a winter storm that landed two feet of snow and inches of freezing rain over the past two weeks, and signs of Mother Nature helping out, are beginning to look slim as temperatures continue to stay in the teens. 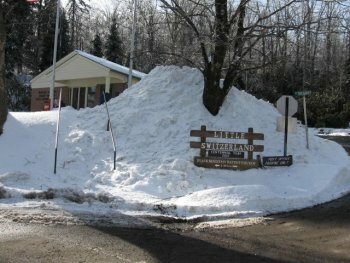 Little Switzerland, among the worst areas hit in Mitchell County, started to make progress last week to become functional by regaining electricity and clearing downed tree limbs to make roads passable. By midday Monday, Mauzy said he was able to chip many limbs of trees laying across his driveway with the help of neighbors Kent and Matt Murphy of Parkway Fire and Rescue. “All the trees have basically been popped and spread out,” Mauzy said. “We are now just trying to chip it up because it is unsightly. Mauzy said little structural damage has been done to the community and its residents homes. He said the extent of the damage is downed gutters and the roof of a neighbors front porch collapsing. Edward Selby, who lives next door to Mauzy on Grassy Mountain Road, lost his front porch and the gutters off the back of his house after an avalanche of snow fell off the roof onto the two. “Somebody called me and said, “Dont be surprised to see your front porch on the ground,’” said Selby, who was out of town. Selby has yet to receive an estimate because his insurance company cannot evaluate the damage because it is still under the snow. Most businesses in the area and the Blue Ridge Parkway remain closed for the Winter. The U.S. Post Office, at the center of the community, has continued its normal operation hours, but needed some help. During the storm, with the parking lot iced over, delivery trucks could not get to the post office. Postal workers, along with Mauzy to carry mail from the delivery truck, parked on Hwy. 226A, to the office 30 yards away. Next on the list is clearing a broken tree in front of the post office with limbs hanging out into the road. Mauzy said the community is chipping away on completely cleaning up the damage, but it may take time. The National Weather Service reports sunny weather for this week; but forecasted temperatures to remain below 32 degrees Fahrenheit. ”We are just going to have to wait it out,” Selby said. The two said it is, without a doubt, the worst storm to hit the area.